In the summer of 1925 an engineer called Vittorio Jano was enjoying the success of a racing car he had designed for a Milan company called Alfa Romeo. Jano's P2 was an extraordinary piece of machinery, driven by some extraordinary talents. Such was the Italian supremacy at the Belgian Grand Prix that year that in the middle of the race Jano ordered that he be served lunch on a table outside the Alfa Romeo pit. He sat there eating his lunch and waving back to heckling Belgians, who were glad of a bit of entertainment as the P2 was so dominant and the opposition so poor that the spectacle was rather flat. Jano even invited his drivers to join him for a drink when they came in for fuel and tyres. Alberto Ascari took victory from his Alfa Romeo team mate Giuseppe Campari by 22 minutes. Back home Italy celebrated. The team returned to Milan for a hero's welcome and the cars were paraded through the city streets and were cheered until the Milanese could cheer no more. And the dictator Benito Mussolini was so pleased that he ordered bomber aircraft to drop flowers on the crowds below. Success like this is always fleeting and should be enjoyed. On Sunday at Monza Jean Todt should perhaps have followed that tradition and shared a banana with beefy Ross Brawn for their victory was absolute. There was no hiding place for the opposition. Minardi had a half-hearted attempt at having a barbecue but everyone else was eating nothing but dust. Lots of people in the Formula 1 world have delusions of one form or another. There are realities that they do not wish to see and barriers that they do not wish to accept. There are those who think of themselves as giants walking the earth and those who are so cunning and devious that even rats will turn and run. And that is what makes the sport such a fascinating activity. That, and the fact that a bunch of young men do remarkable things with remarkable pieces of machinery. It is a world where the impossible is there to be achieved. But no matter how hard one tries and how much one believes that one is right, the impossible still exists. And we saw that clearly on Sunday. Ferrari finished 1-2, or perhaps one should say 2-1, and Rubens Barrichello and Michael Schumacher did that despite each having to overcome a major setback which should have precluded the possibility of a good result. Each drove a stormingly good race and was rewarded for it. Jenson Button, who finished third, did nothing wrong. He drove flat out all afternoon in a car that was as good as it gets and there was nothing he could do to beat the Ferraris. There was nothing anyone could do. And that was the story. It is time for the delusions to be faced. No-one is going to beat Ferrari this year, except Ferrari itself. Everyone else should hurry home to the drawing boards and try to make sure that next year they are not so weak and feeble. "I didn't think that the Ferraris were going to be so strong towards the end of the race," Jenson Button said. "The pace of these two guys was just untouchable. Their performance in the dry is just staggering." And dry it was after a morning of really miserable weather. The track was damp but as the grid formed up the sun was out and teams were faced with a decision: was it wet enough for intermediate tyres or could the drivers survive on grooved slicks? The man who knew the answer (inevitably) was Bernie Ecclestone who told a gaggle of visiting Ferrari-clad government ministers that the weather was not going to be a problem. "It'll be dry," said Mr E. "After three laps the track will be completely dry." And so it was. That point was made blatantly obvious by the lap times. The four men who chose to race on intermediates (or shallow wets of whatever you wish to call them) gained a huge amount in the first two laps. Gianmaria Bruni at one point was up to 10th place. Others were making mistakes. Ironically the two most experienced men in the F1 paddock Michael Schumacher and Olivier Panis were the two men who made the worst mistakes as the field thundered into the Roggia chicane. Both were only vaguely in control of their racing machines. Michael slid into Button, destabilized his car and spun. Panis slid into the back of Antonio Pizzonia and spun the man from the jungle. Olivier climbed out and trudged off home. Michael and Antonio went back to work. At the end of that first lap Barrichello's advantage was a shocking 6.9secs. "It was a difficult decision," said Rubens. "When we went to the grid it was fairly wet. The sun was out and basically it was going to dry but it was very difficult to know when. I thought that with wets I could open up a gap in the first five laps that I would be able to really be happy with after the pit stops." It helped that he was running with a light tanks of gas and was going to have to stop early anyway. The risk was less. At the end of the second lap Rubens's lead was 8.2secs and then on lap three the advantage was gone. Barrichello, Felipe Massa and Bruni began to drop back. On the fourth lap Alonso took 3.8secs out of Barrichello and on lap five he overtook him just before Rubens went into the pits. He rejoined in ninth place, which was not bad. His strategy was now offset from the others and he needed to be watched. The problem was that it was difficult to judge how it would all end. "I just kept pushing and pushing," he said. "I was telling myself 'You deserve this, just push the throttle down and go as fast as you can'." While this was going on, we were all watching what looked like being a Jenson Button victory. We were aware that Barrichello was still there but had not grasped the implications of what he was up to. We could see Michael storming through the field but surely, we said, he cannot win from that far back. And then came the great flash of realization. As Rubens went in for his final stop Michael was lining up to pass Button. As Rubens accelerated out of the pits so Michael towed past the BAR. And Button knew that he was third and the first of the losers. But he was happy enough because, with Takuma Sato fourth, the BAR-Honda team was to go home with 11 points and second place in the Constructors' title. Renault went home with nothing. Fernando Alonso had tried too hard and spun off (which a racing genius at this stage in his career should probably not have done) while Jarno Trulli gave the impression that he did not want to be there at all. The oddest thing was that in the last three laps Jarno suddenly went incredibly fast, much faster than he had all day, and one might be forgiven for thinking that therein lay a message for the Renault management. Trulli has not scored a point since the team decided to fire him and the team has slipped backwards. If Renault is to beat BAR in the Constructors' title it needs to do something dramatic. We do not expect to see Trulli in a Renault in China and one got the impression that Jarno knew that. His final flying laps might be perceived as nothing more than a raised middle digit directed at a Mr Briatore, to show him what might have been. Perhaps not, but I'll bet that the Renault engineers will find nothing wrong with the car when they strip it down. The Renault people have only themselves to blame for Trulli did not deserve the treatment he was given this year. Briatore baked that cake and now he has to eat the result. 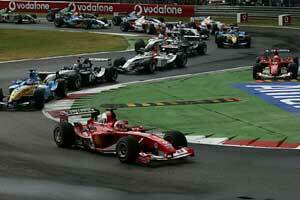 The remaining points went to Montoya, Coulthard, Pizzonia and Fisichella but they were just the supporting cast. Montoya drove a steady race from flag-to-flag (as he has done a lot recently) and complained that the car was getting worse as it went on. In the final lap and half he had a gearbox problem and only just made it to the line to take fifth. Behind him Coulthard and Pizzonia were hard at it. Coulthard's race had been a good one because on the parade lap he had realized that intermediate tyres were not a good idea and had headed for the pits rather than the grid. The team topped him up and sent him on his way for a long-haul one-stop strategy. It was hard work but DC came home sixth despite a collision with Pizzonia as the two scrapped for sixth place on the penultimate lap. Pizzonia too had done a good job after Olivier Panis's rude assault on the first lap. Jungle Boy was 19th at the end of the first lap but went through the field like a veteran. One has to say that any doubts about his ability from his unfortunate time at Jaguar last year have now been forgotten. Now Antonio needs a car in which to go racing in 2005. Of the rest Kimi Raikkonen might have collected points if the car had finished. It did not and to mix cliches the fact that my auntie had a moustache does not man that she is Norbert Haug. If Mercedes-Benz want to be serious about winning races the engines must be more reliable. Sauber got the final point thanks to another good race from Giancarlo Fisichella while his wayward team mate Felipe Massa continued his wayward career. The decision to use intermediates served him well and he was up to sixth when he pitted. But as he tried to climb back through the order he crashed into Nick Heidfeld (there is no history between those two, is there?) and that meant that Felipe had to go to the pits for a nose job. After that 12th place was a good result. The Jaguars looked good in the early laps but then they faded and Mark Webber and Christian Klien came home ninth and 11th. Webber let Michael Schumacher know that he is not a shrinking violet but in the end Mark made a small mistake and Michael overtook him. Pizzonia latter did the same and so Webber got what he could. A point would have been nice. Toyota did not have much to shout about. Panis was gone straight away and Zonta seemed most of the time like an invisible man, lapping in the midfield without ever making much of an impression. He finished 11th. The Jordans did what Jordans do and Heidfeld's hopes of glory (limited though they were) ended after the attack by Massa. He was on a one-stop strategy after his engine failure in qualifying and 14th was as good as he could have hoped for. Giorgio Pantano was racing on two-stop strategy but just after his second stop crashed heavily at the Parabolica and was not sure what had happened. "Once I had spun there was nothing I could do," he said. And that left Minardi. Bruni's moment of glory in the first laps was quickly over but he was back in the news at his second pit stop when the car was suddenly engulfed in flames. The blaze was put out with impressive speed by the team and by fire marshals. The problem was that a small amount of fuel had remained in the refuelling nozzle after it was disconnected from the car and this dropped onto the ground and went under the car and ignited. No-one was hurt but Bruni inhaled some of the extinguisher fumes and was having trouble with his breathing and so the lightly toasted car was retired. Zsolt Baumgartner, the unfortunate victim of two unwarranted assaults by other cars in Belgium and then in practice at Monza, was happy to finish. He spent the afternoon having accidents all by himself and his adventures gave the team some more TV coverage. By the end there seemed to be a well-worn path through the first chicane but he made it home in 15th place. And so it ended. Italy celebrated but no planes came over and bombed the crowd with flowers. The team bosses rushed away. Helicopter rose from the fields and the party was over. Next stop Shanghai and all we can do is hope for a surprise.